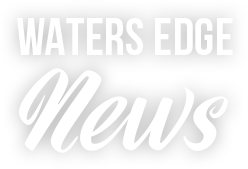 If you are looking for a lakefront property in Alberta, the Estates at Waters Edge offers multiple purchase options to meet your needs and budget. Our private, gated community is perfect for both a permanent residence or weekend retreat. Best of all, we have several homes that are move-in ready. This month’s post highlights three quick possession homes that feature unique floorplans and finishes ready for happy new homeowners. This brand-new lake facing bungalow was designed with exterior features reflecting the craftsman style charm that Waters Edge is famous for. 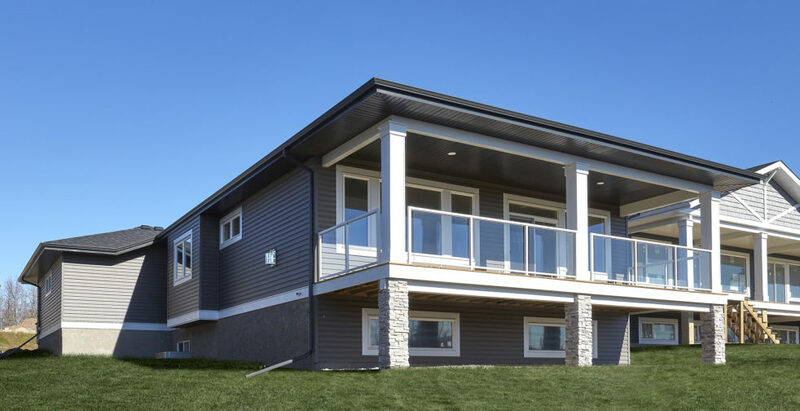 Stunning blue siding is complemented with neutral stone for an impressive finish. The sizable front porch provides a quiet, serene area to enjoy your morning coffee while looking onwards to the lake. 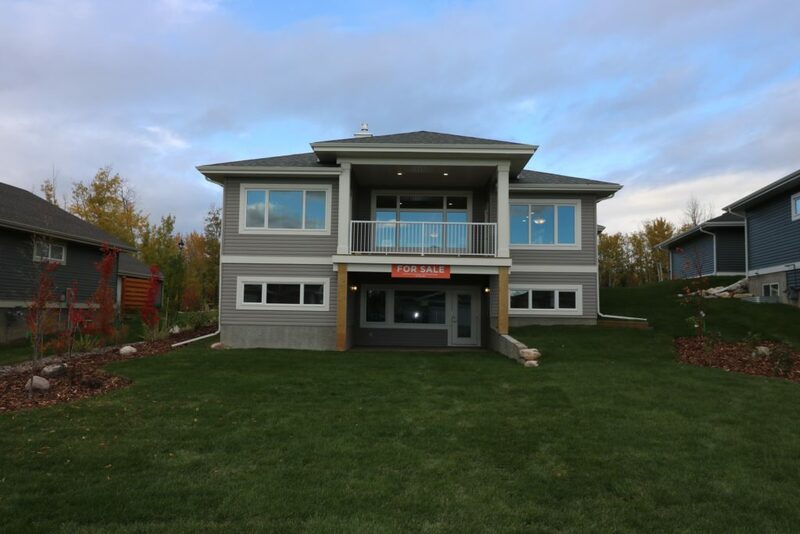 This home is unique as it provides two outdoor living areas, a front porch and a large rear yard backing onto a wooded area. 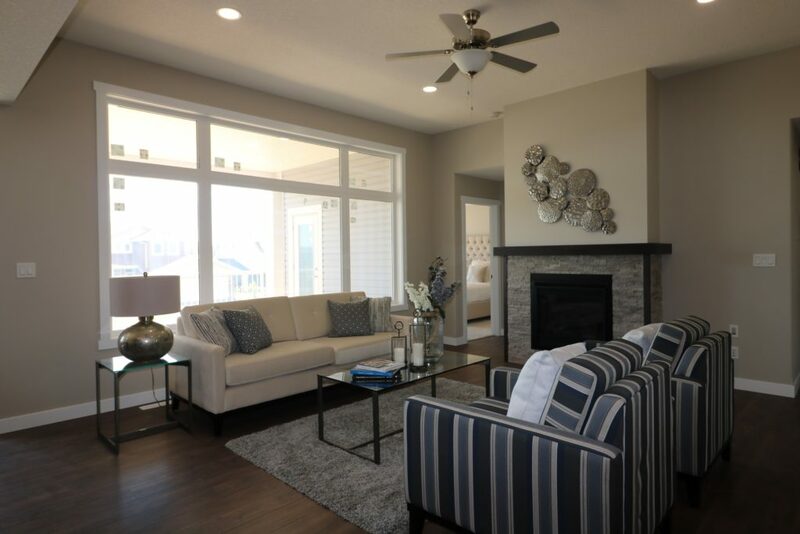 The open concept floorplan is generous in size, perfect for entertaining. Rich dark laminate covers the main floor, providing contrast to the white stone details of the fireplace. The living room includes a picturesque view of the lake. Taking a slightly modern approach in the kitchen, a white textured backsplash and dark quartz countertops really make this space pop. An oversized sink in the island is surrounded by white cabinets with a sleek, clean finish and stainless-steel pulls. You can find this home on the northside of the community on lot #609. This 1270 sq. 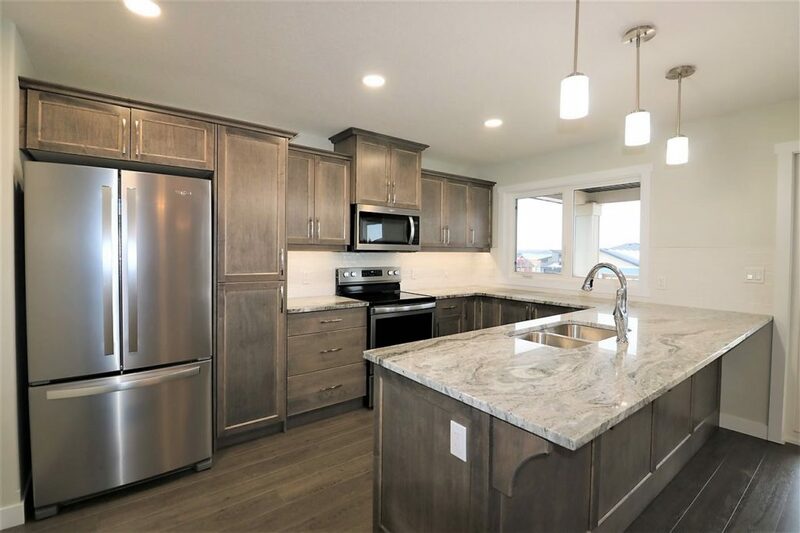 ft. walkout bungalow takes full advantage of stunning lakeviews with wall to wall windows in the open concept kitchen, living, and dining rooms. This space makes it easy to entertain, with a huge covered deck off the main living areas. The wrap around kitchen provides plenty of counterspace, boasting an oversized peninsula with breakfast bar. 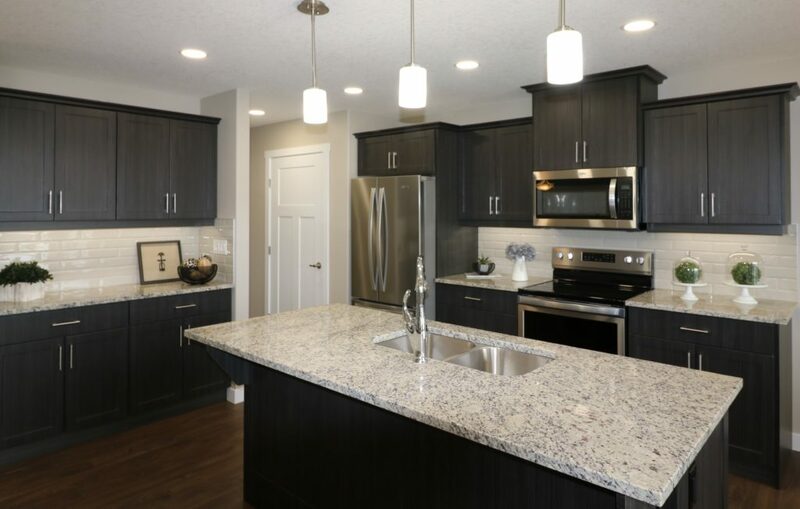 The maple cabinets include hints of brown and charcoal, pairing beautifully with the granite countertops. 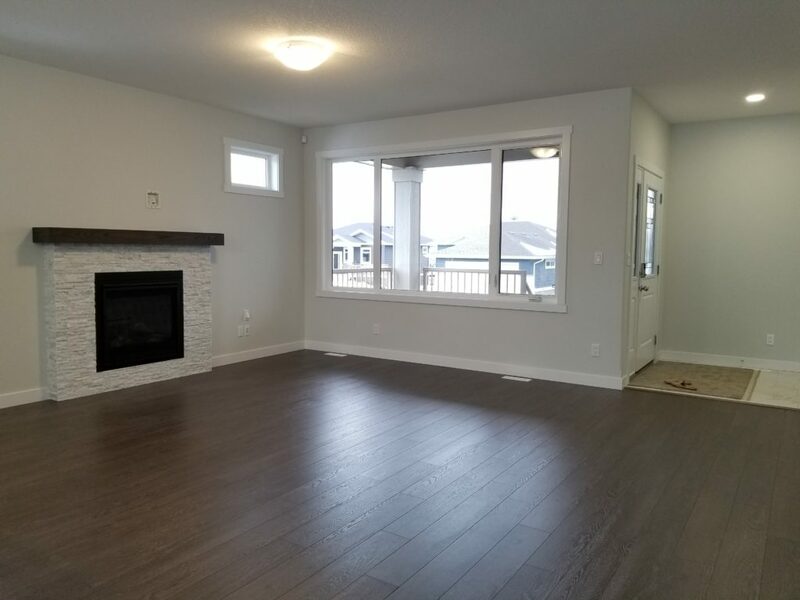 The gas fireplace is situated at the far side of the living space creating a cozy area to gather with friends and family. The master bedroom is complete with a walk in closet and large ensuite, and standing shower and double sinks finish off this master retreat. Other notable features of this home include main floor laundry and an oversized double stall garage. This beautiful home is located in the middle of the community on lot #212. 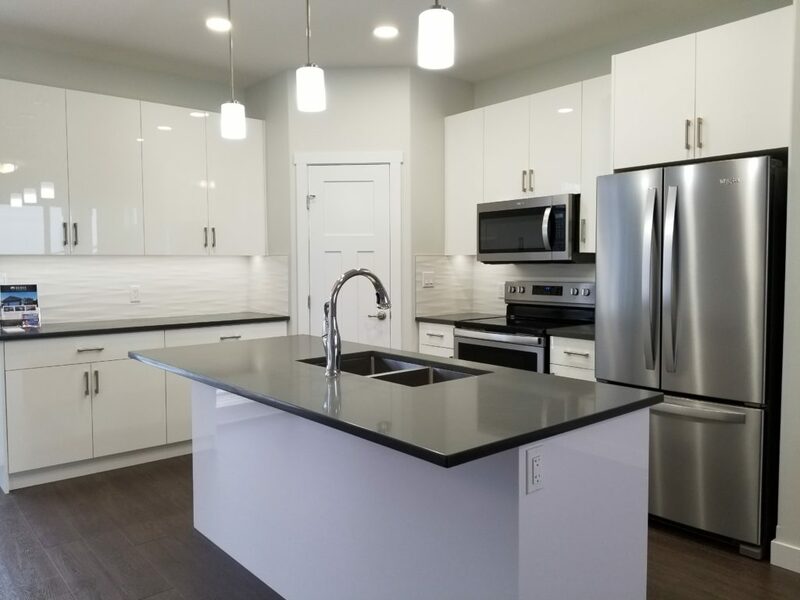 This brand-new bungalow features the Maple floor plan with 4 bedrooms, 3 bathrooms, and an open concept kitchen, living room, and dining area. 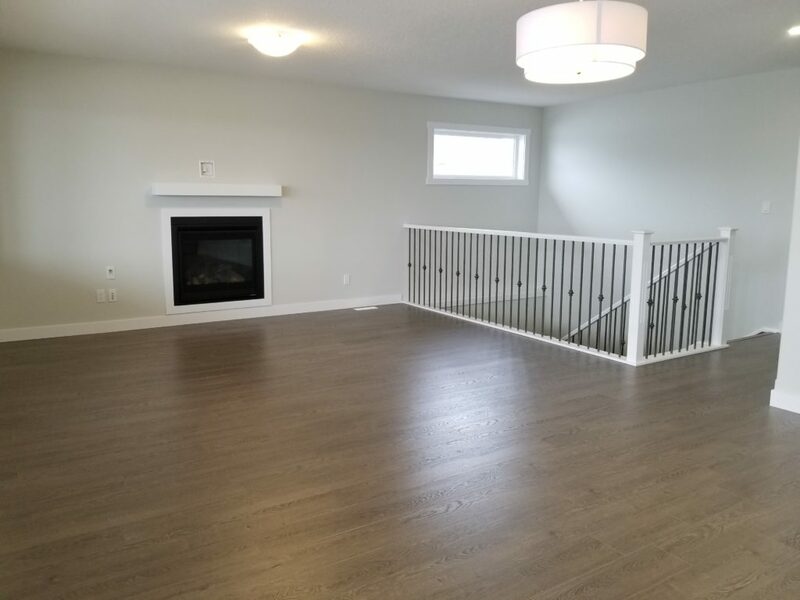 Laminate floors flow through the main level with a complementary carpet in the bedrooms and basement. The L-shaped kitchen features an island with an overhanging breakfast bar which looks onward to the dining and living rooms. Granite countertops and custom vinyl wrap cabinets style this kitchen with a rich color pallet. The gas fireplace with custom masonry details is situated at the far side of the living space creating a cozy area for friends and family. The master bedroom is complete with a walk-in closet and ensuite, with access to the lake-facing deck. Moving downwards to the basement, custom handrails and pewter spindles complement the rest of the home. The fully finished walkout basement features two more bedrooms, a full bath, and a rec area. You can also find a generous storage room to the front of the home, perfecvt for seasonal items. 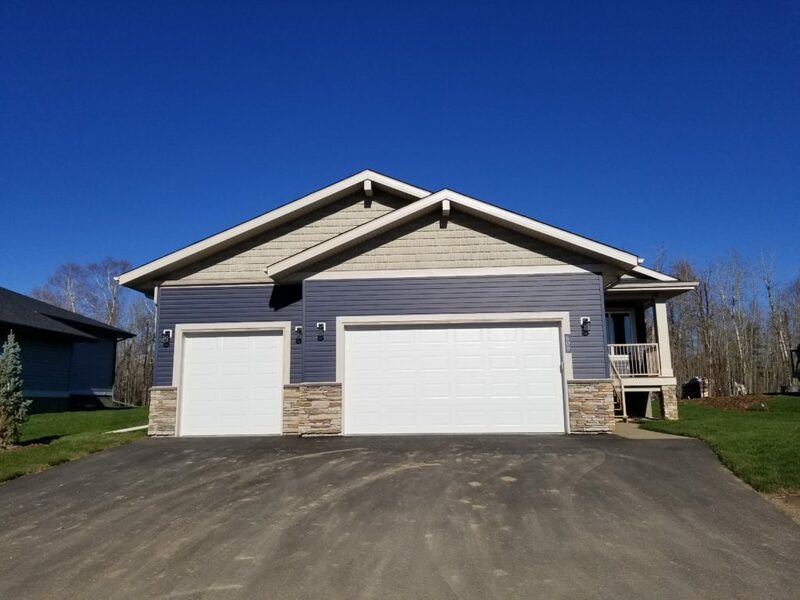 This maple bungalow is located on the north-west side of the property on lot #546. 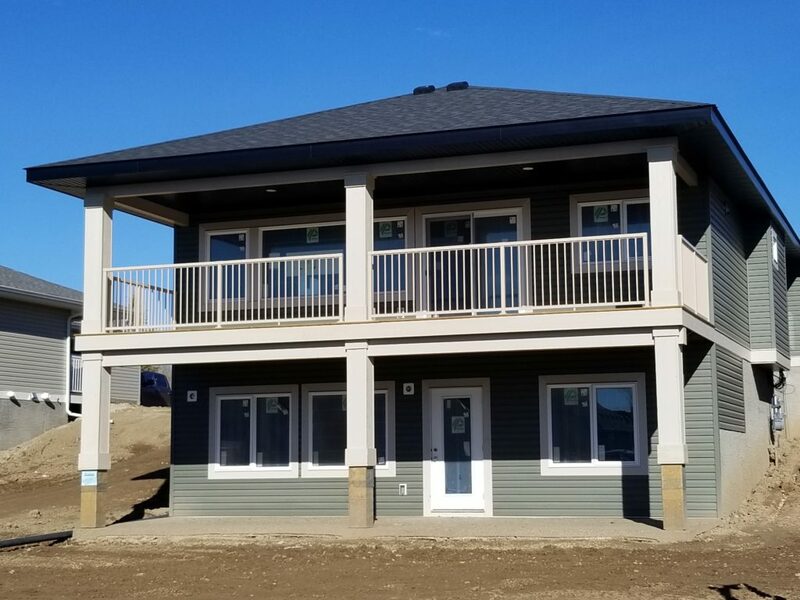 Interested in one of our homes? Contact Fred Trommeshauser of Re/Max Real Estate Spruce Grove at (780) 962-8580.